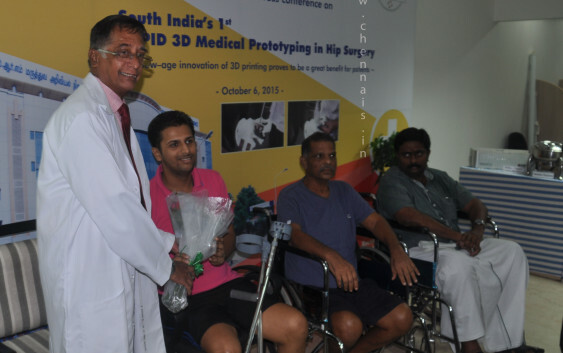 October 06, 2015, Chennai : Patients sustaining major fractures of the hip socket or having failed hip replacements frequently develop pain due to major bone loss, tissue damage and socket irregularity. This requires a hip replacement to be done in the altered anatomy which is a very challenging task for joint replacement surgeons. Till recently doctors were constrained to undertake the surgery with a ‘Mental Image’ of the defective pelvis based on CT scans. This resulted in surgeons trying out various options during the surgery by trial and error before deciding the type of reconstruction. Needless to say Surgeons often found the defects to be too extensive during surgery and hence had to abandon reconstruction completely. Need for bone graft or supplemental plates. This new technology of 3D – Rapid Medical Prototyping is proving to be a boon for surgeons and patients as it helps the surgeon to rehearse the surgery before the actual operation. The surgery for the 3 patients who had the prototyping was exceptionally successful and they are all making a good recovery. As an initial step DICOM images of the pelvis are made using CT scans. The further software steps required are image segmentation, 3D Reconstruction and creation of STL files. These STL files are fed into a very sophisticated medical grade 3D printer which prints this 3D – Medical Model. An orthopaedic surgeon trained in these software applications is crucial to create the medical grade 3D prototype with sub millimeter correlation to the patient’s pelvis. SRM Group well-known for their educational forays as part of their growth, the Group has now started SIMS a 345-bed corporate hospital at Vadapalani, Chennai which has the complete spectrum of Medical Services. Each Institute has all relevant sub specialties under its fold.